An early sketch of DARPA's reusable space plane design, the XS-1. "We are, frankly, in the midst of what I believe is a little bit of a crisis," Fred Kennedy, director of DARPA's Tactical Technology Office, said at the International Symposium for Personal and Commercial Spaceflight in Las Cruces, New Mexico, on Oct. 12. "If it takes me 20 years to build a constellation of geosatellites to do, [for example], ballistic missile early warning, and it costs 20 billion dollars, that's a problem," Kennedy said. "Because someone else might figure out how to put up similar capabilities or develop countermeasures in that period. And you might not be surprised to find out that, guess what, our adversaries do just that." DARPA's answer to this crisis was to create a concept for a space plane called the XS-1 that could put satellites into orbit (up to 3,000-lb. or 1,360-kilogram payloads) or service existing satellites. The plane would launch vertically using an AR-22 engine built by Aerojet Rocketdyne. The vehicle itself would have the reusability of a commercial airliner; specifically, DARPA's primary requirement is that the plane can fly to space 10 times in 10 days. Eventually, the cost of a launch could drop to less than $5 million, DARPA representatives have said. In May, the agency announced that it had selected Boeing to build the first XS-1 (which the company will name Phantom Express). The first test flights are scheduled to take place as early as 2020. A demonstration vehicle could fly as early as 2019. "If we could go up into [geosynchronous orbit], perform inspections, potentially move satellites around, correct problems such as stuck booms or antennas, and install … new capabilities, I'll tell you right now, it would be great for the defense department," he said. "To be able to retrofit legacy spacecraft that we have spent billions on would be useful for us." 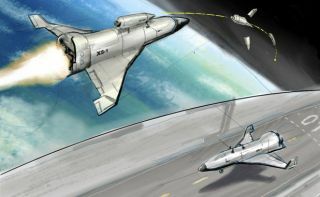 A digital representation of the XS-1 space plane in flight. Kennedy said he thinks there are certainly "glimmers of hope" that commercial-industry members are also addressing the satellite crisis. For example, SpaceX's arrival as a large-payload launch provider has increased the number of launches available to customers and has also introduced cost competition against United Launch Alliance (ULA), which was for many years the only large-rocket provider in the U.S. But ultimately, Kennedy argued that both vehicles and satellites need to scale down. Large satellites are costly to build and carry a high risk if they can't be repaired or replaced easily. Kennedy applauded the handful of companies working to make smaller launch vehicles, which makes it possible for small payloads to get to orbit without piggybacking on larger payloads. These smaller vehicles also have the potential to launch more frequently than what's possible with massive rockets like the SpaceX Falcon 9 and ULA's Atlas V.
For all the new small-launch vehicles appearing on the market, Kennedy said he fears there aren't enough payloads to match. Satellite manufacturers need to make small satellites that have a wide range of capabilities, and that aren't as costly or as specialized as communications and defense satellites have historically been, he said. "They're Rolls-Royces," Kennedy said of many legacy satellites, because they are "very expensive and very complex. … They require a lot of manual labor, a lot of testing, a lot of independent verification and validation activities. That's all [additional] cost. It’s a fragile architecture." A digital representation of the Boeing-built XS-1 space plane. Once again, Kennedy argued that this approach also makes the satellite owner vulnerable to attack. Constellations that consist of only two or three very expensive satellites that are difficult to get to space are much easier to disable or build countermeasures against than constellations consisting of tens or hundreds of small satellites that can be replaced or repaired quickly. "We need to investigate alternatives; certainly for [Department of Defense] alternatives," Kennedy said. "But I think the beauty of this is, there's so much going on right now in the new space community that could potentially address this. It's very exciting. We have a renaissance underway. In a couple or three years, the fad will fade. The venture capitalists [are interested now], so what are we going to do about that? We need to strike while the iron is hot, while all that money is available on the commercial side." In anticipation of an increase in the number of satellites orbiting the planet, DARPA has also initiated what it calls the Consortium For Execution of Rendezvous and Servicing Operations (CONFERS), which will essentially bring together members of the spaceflight industry with representatives from government agencies involved in spaceflight to discuss "the rules of the road" for satellites and vehicles orbiting the Earth. He compared it to laws that dictate commercial and government activities on the ocean. "This is not a normal DARPA play," he said. "However, we think it's so important that we get this right, that we want to be involved at the beginning. And we also want to make sure that in a couple of years, this is something that can stand on its own in industry. This should be a commercially driven activity first."